Yooralla is committed to supporting our volunteers and valuing their contribution to the customers and the organisation. Yooralla wants all volunteers to feel happy, safe and - most of all - feel that they are using their skills and experience to provide opportunities for others. Yooralla volunteers are not expected to do the work of a paid employee, rather enhance the programs and activities with their passion and enthusiasm. There are many reasons why people chose to volunteer. To promote personal growth and self-esteem. You get a chance to contribute and strengthen the community. To learn and discover hidden talents and passions. What are your strengths, skills and passions? Yooralla offers a large number of services to people with disability and you can volunteer across the organisastion. Yooralla has 16 hubs across Melbourne, where customers can meet new people, pursue their own interests or get out in the local community. 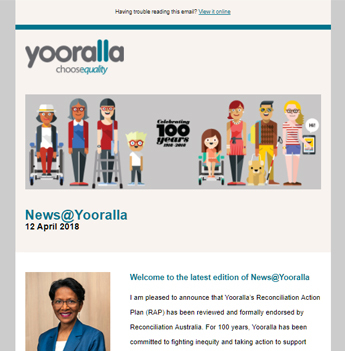 Find out more about Yooralla's Community Hubs. health and wellbeing through social and recreational activities. Learn more about Recreation services at Yooralla. Do you have experience and skills in administration? Give back by helping with specific tasks in our offices. Would you enjoy working with being engaged with a group of people with similar goals and interests in their home? Learn more about Accommodation services at Yooralla. Would you like to help support individuals, families and carers with respite programs and activities? We work with all ages and provide facility and community based programs. Learn more about Respite services at Yooralla. If you have retail experience - or just a passion for fashion - volunteer at Yooralla's new Opportunity Shop in Chelsea. Fill out our expression of interest form and the Volunteer Engagement Manager will get back to you within 48 hours. If you already have an idea of where you would like to volunteer, and would like to get started, please fill in the form below. Once these are complete, email the forms to volunteering@yooralla.com.au. If you are enquiring about completing your Community Service Voluntary hours with us please clearly state this is your purpose so we can find an appropriate volunteer position for you.